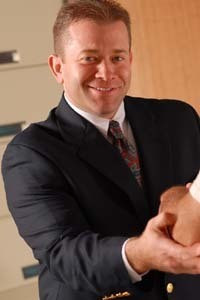 Scott Silverstein, MD is a board-certified orthopedic surgeon. He was honored to be named a 2012-2018 Top Doctor in General Orthopedics and Sports Medicine by Baltimore Magazine. Dr. Silverstein earned his medical degree at the University of Pittsburgh School of Medicine. He completed his internship and orthopedic surgical residency at the West Virginia University Hospitals in Morgantown, where he served as Chief Resident. He was an Assistant Professor on the WVU faculty after graduating and served for a time as the Education Director. He enjoys weight training and spending time with his wife and twins. He successfully climbed Mt. Kilimanjaro in 2000 and his feet are still sore! Dr. Silverstein is a fellow of the American Academy of Orthopaedic Surgeons.